Following its tradition, the world’s leading video-streaming platform, Netflix has released the monthly ISP speed index for July 2017. According to the data released, Spectranet has the best monthly average internet speed in the country. Spectranet is an Indian ISP whose average speed registered as 3.19 Mbps in July 2017, which takes it to the top position dethroning 7 Star Digital. Spectranet’s average speed is up from 2.69 Mbps it secured in June 2017. 7 Star Digital has been the pioneer in this segment, but this time around, it settled with the second spot with an average speed of 2.80 Mbps, which is up from 2.77 Mbps it achieved in June 2017. Even though the speed of 7 Star Digital increased by a marginal number, it wasn’t enough for the operator to retain the number one position. 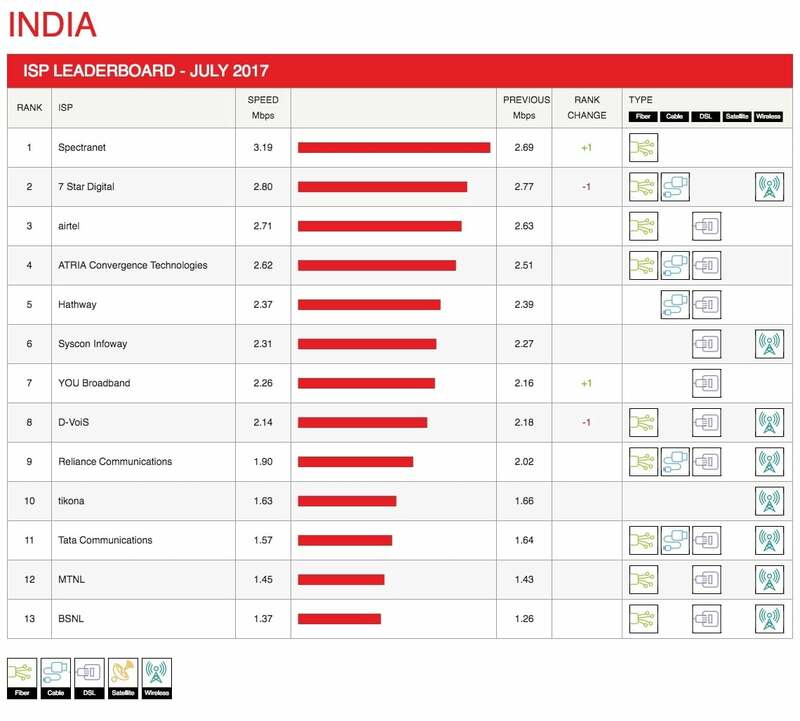 Spectranet, India’s first 100% fibre broadband service provider secured the top position in Netflix’s ISP Speed Index. “Spectranet saw speeds climb up to 3.19 Mbps, up from 2.69 Mbps the month prior, reclaiming the No. 1 spot in India”, said Netflix on its blog. Speaking about other ISPs, India’s leading operator in the mobile broadband space, Bharti Airtel has retained the third place, with an average speed of 2.71 Mbps. ACT Fibernet, which made India a Giga City is still in the fourth position with an average speed of 2.62 Mbps. Next up in the rankings are Hathway, Syscon Infoway, You Broadband with an average speed of 2.37 Mbps, 2.31 Mbps, and 2.26 Mbps. State run operators MTNL and BSNL secured 12th and 13th positions with an average speed of 1.45 Mbps and 1.37 Mbps. The Netflix ISP Speed Index is a measure of prime time Netflix performance on a particular ISP and not a measure of overall performance for other services/data that may travel across the specific ISP network. Faster Netflix performance essentially means better picture quality, quicker start times and fewer interruptions. Airtel deserves the No. 1 spot, being a pan India operator !